From a political perspective, Europe at the moment may be having a tough time with one crisis after another, but scientifically there are many exciting things. 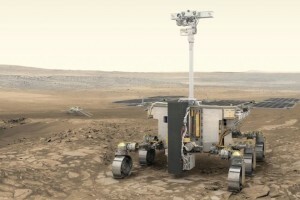 For example, the ESA (European Space Agency) wants, in the very near future (in 2020 to be exact), to send an automatic robotic vehicle (rover) to Mars, which should land at the beginning of 2021 and subsequently will search for an extended period for indications of (past) microbial life on the red planet. One of the most fundamental questions within astronomy and space travel is whether there is any life outside of the Earth (“Are we alone?”). The Mars rover will attempt to answer this question. For this purpose the rover has a powerful drill on board that can drill up to 2 m deep into the Mars surface, in order to check whether there is or was any life at greater depths. The Mars rovers that have been sent by NASA (that is, by America) to Mars, all have ‘inspiring’ names such as Spirit, Opportunity and Curiosity. The European missions have typically been named after famous scientists (well-known examples are Schiaparelli, Cassini and Huygens). But for the ExoMars mission (‘ExoMars’ is certainly not the final name) a more inspiring name is sought. In 2014 Great Britain acquired the right to give the European Mars rover a name. The reasons for that were of an (obviously also) political nature, but also the not insignificant fact that the United Kingdom provided the largest financial contribution to the mission (the was therefore before all the Brexit vicissitudes...). In any case, the desire was to make the search for a suitable name as broad as possible: all residents of the countries that are a member of the ESA are allowed to participate. only one name suggestion will be accepted from each entrant.